APNATORONTO.COM is currently offering a thorough practice quiz for motorcyclists who are getting ready to take the Ontario M1 test. Our efficient online M1 practice test allows motorcyclists to review examples of the 240 questions that appear on the exam. This test is absolutely free and it is essential for motorcyclists, as you are required as a rider to understand the rules of the road and follow the required safe driving practices in order to operate a motorcycle. Listen to Class M1 license practice test on your computer, cellular phone or portable audio player. You can also download the complete M1 practice test in audio format. APNA Toronto offers an Ontario M1 Motorcycle Test to help new drivers best in preparing for the day of their exam. Our M1 test features in-depth test questions and many of the same questions may be found on the actual exam. Since 2006, we have been offering a valuable resource to new drivers by providing a comprehensive online test which they can use to best prepare for their actual exam. We have compiled the most relevant test questions which can help you to best prepare to receive your motorcycle license. Ontario applicants will find that the test covers many different topics and subject matters, and it is essential to be well prepared for the actual exam. We can help you to pass your test with confidence so you can enjoy your time on the open road. Our online practice test is comprehensive and efficient and allows motorcycle riders to review more than 230 sample questions. Our M1 practice test is completely free of charge and is especially designed to prepare you best for the actual exam. The test is inclusive of the safety rules and regulations that are necessary to learn prior to operating a motorcycle. Although there is no guarantee of passing your exam, we offer an extensive range of information, so you have the best chance of a successful outcome. We are pleased to serve the community of Ontario and Toronto with quality resources that provide the information they need. For more resources, please browse the other areas of our website. What does it mean if I have Condition 1 added to my motorcycle licence? You can only ride three wheeled motorcycles (motor tricycles). 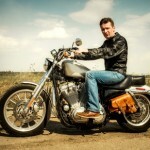 How long will it take to obtain my full motorcycle licence? The average time from first application to full motorcycle licence is twenty months. What happens if I fail the road tests at any point? If you fail the test for your Class M2 licence, you may take the test again providing your temporary driver's licence is still valid. If it is not you may be able to obtain a one-day temporary licence to allow you to retake the test, provided you booked the test before your temporary licence expired. If you fail the Class M test, you may retake it. What are the requirements for beginning the Ontario motorcycle licence program? You must be at least sixteen years old when you apply, be able to meet the Ministry of Transportation vision standards and pass a knowledge test encompassing traffic signs, knowledge of motorcycles and the rules of the road. I have a full Class G vehicle licence, will this make it quicker to obtain my full motorcycle licence? No, everyone must begin the graduated program from the beginning (with some exceptions detailed below). What are the graduated steps to obtain a full motorcycle licence? Firstly you must fulfil the conditions for application for an M1 licence, then within ninety days of receiving this you must take a test for the M2 licence (you must have at least sixty days of riding experience for this) and you can then progress to taking a test for your full motorcycle licence. Are there any limits on what I can do while riding on an M1 licence? Yes, you must have a zero blood-alcohol level at all times when riding, ride only during daylight hours (half an hour before sunrise to half an hour after sunset), wear an approved helmet, not drive on roads with speed limits in excess of 80 km/h (except highways 11, 17, 61, 69, 71, 101, 102, 144 and 655) and you may not carry passengers. What limitations are there to riding on an M2 licence? You must still maintain a zero blood-alcohol level when riding and wear an approved helmet, but you are permitted to ride at night and on any road. How soon after achieving my M2 licence can I take a test for the full motorcycle licence? To take the test for an M licence you must have been riding with an M2 licence for at least twenty-two months. If you successfully pass a government-approved motorcycle safety course, this time limit is reduced to eighteen months. I have a full motorcycle licence from another jurisdiction, can I exchange this for a full Ontario motorcycle licence? Only if the licence is issued by a jurisdiction which has a reciprocal agreement with Ontario (another Canadian province, the United States, Switzerland, Australia, Northern Ireland or Canadian Forces Europe) and you have held it for two years. If you have a licence from one of these jurisdictions but less than two years of riding experience, you may be eligible to start the graduated licensing program from M2 level. Otherwise you must start the program from the beginning. If I have an L restriction on my motorcycle licence, what does that mean? You are restricted to limited speed motorcycles or mopeds, which cannot exceed a maximum speed of 70 km/h. Will the test always run its full course? Not necessarily; the examiner may stop the test, or refuse to start it, if s/he decides that your bike is not in good working order, that you are impaired by alcohol or drugs or that your driving skills preclude finishing the test safely. If I fail the test, how soon can I take it again? And how many times? You have to wait at least three days after failing a test to take another one. You can take the test as many times as you like, provided your motorcycle licence is still valid. You must pay the required fee to repeat the test. If I pass my M2 road test, am I qualified straight away? Yes, you will be issued with a temporary driver's licence which is valid for ninety days or until you receive your permanent photocard licence in the mail. What do I need to take my Class M2 road test, and what does it involve? You must have been practising on your temporary (M1) licence for at least sixty days. The test assesses basic driving skills and takes around twenty minutes. Is there any way I can obtain a Class M2 licence without taking the road test? Yes, if you successfully complete a Ministry of Transportation approved motorcycle safety course the training organisation will either give you a paper confirmation of this or send electronic confirmation to the DriveTest Centre of your choice. You can then apply in person to the DriveTest Centre and be awarded an M2 licence without testing. What does the full motorcycle licence road test involve? This test takes around half an hour and involves driving on roads and highways where you will be followed by a car carrying a driver and an examiner; the examiner will instruct you as to what to do via a radio link. When can I take the necessary motorcycle road tests? Road tests for both licences (M2 and M) are held between mid-May and mid-October each year unless the period is curtailed by bad weather. You can book your road test from May 1st each year. How should I prepare for my motorcycle road test? Study the Official MTO Driver's Handbook and the Official Motorcycle Handbook and practice all the necessary manoeuvres in a variety of different locations, times of day and weather conditions. You can also practice here for your M1 Test. Can the DriveTest Centre loan me a motorcycle for the test? No, you must bring your own motorcycle or one that you have borrowed or rented. It is your responsibility to make sure that it is of the correct class for your test and in good working order; you must also have the appropriate insurance for the motorcycle. What do I need to bring to my motorcycle road test? You must provide a motorcycle in good working order, glasses or contact lenses if you need to wear them for driving, your current driver's licence, a printout of the confirmation email for your test and a helmet that complies with Regulation 610 of the Highway Traffic Act. It is recommended, though not compulsory, that you wear either a full face or three-quarter face helmet which will help you to hear the examiner's instructions better than a half helmet. Can the examiner give me hints to help me pass the test? No, coaching is strictly forbidden; if you have any questions about any parts of the test make sure you ask the examiner before the test begins.